I am supporting the Girl Scouts by buying their products. I bought these pistachio and whole cashew nuts from my co-worker's daughter for her school fund raising. I got them just in time for thanksgiving. Other than their nuts and candies, I also love girl scout cookies. From my family to yours - Happy Thanksgiving Day! Charter, one of the leading cable, internet and telephone providers is once again giving away a lot of exciting prizes to its customers. For the past two years, Charter has been so generous to its lnew and loyal customers through their sweepstakes giveaways with great prizes like an HDTV, Toyota Prius, a new 2010 Chevy Camaro, Xbox 360’s, laptop computers and more. Now, before the year finally ends, Charter is bringing again big prizes. There are two ways to win: get great deals on charter cable, internet and phone services, free gift cards plus special online deals and chance to win cool prizes for the holidays. Starting on Black Friday to Cyber Monday, Charter is offering $200 worth of gift cards from major retailers and restaurants to customers with special online deals. Win these gift cards, you can use it for your holiday dining and shopping. Then for 38 days after Cyber Monday, Charter is giving away great gifts like Ipods, camcorders, TV, GPS units, etc. There will be winners everyday so always check Charter’s Daily Deal Web Site or if you have a face book account, become a fan of Charter on Facebook to keep up with all these great deals and prizes from Charter. Because of the recent news from the Philippines particularly from the recent killings in Maguindana, the Maguindanao Massacre ranked as the seventh most popular search in Yahoo. Yesterday, when the news first broke, Philippines was on the top ten yahoo search too. Are you looking for a perfect gift this Christmas season for a friend or a family member? If you are familiar about stem cells, why not consider giving a gift certificate for cord blood banking from Cryo C'elle International. This can be also the best gift you can give to parents who are expecting a baby. The preservation of an infant’s cord blood gives the parents a health security and protection. Parents through Celle International are taught the value of cord blood preservation and how the u-cord blood stem cells are known to have treated more than 75 diseases and also used in more than 12,000 transplants world wide. Through C'elle’s exclusive and revolutionary service, the newborn’s umbilical cord blood are collected for future use. The stem cells found can be a treatment for yourself or possibly even a member of your family against a lot of life-affecting diseases. Through C'elle’s exclusive and revolutionary service, the newborn’s umbilical cord blood are collected and cryo-preserved or “frozen in time” for future use. If you want to buy the Cryo C'elle cord blood bank gift certificates, they come in different denominations starting from $50. This Christmas, give a very unique gift that can protect the future health of your loved ones. For more information, visit celle.com or call 24/7 at 1-877-892-3553. But, it’s ok. First, it’s going to be a short work week. A lot (so with school) are off Thursday and Friday for Thanksgiving break. My daughter has half day on Wednesday. For Thursday, Happy Thanksgiving. It’s going to be at my friend’s house this year but I have to cook. I may do inihaw na bangus, shrimp tempura and turon. And, it’s Black Friday!!! Are you going to line up at a store at 4:00 in the cold freezing morning? Branson Ozark Mountain Christmas is one of the top 100 events in North America for 2009. Experience the festival of lights in almost every shop and theaters while everybody are all on Christmas holiday joy. Branson holiday entertainers bring Christmas spirit to their visitors and families through their entertainment and Christmas shows. It is nice to bring the whole family to Branson, Missouri during this time of year. 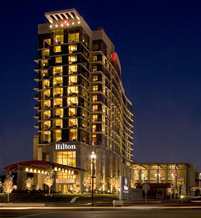 The two Hilton hotels are always ready to accommodate you. There are holiday packages that you can avail at the Hilton Promenade at Branson Landing and Hilton Branson Convention center Hotel. They have the It’s a Wonderful Life package starting at $329 per night from November 15 thru December 23rd. The little ones will surely enjoy the Story Time with Mrs. Claus at the lobby of the Hilton Branson Convention Center Hotel and if you avail of the Santa’s Coming to Town Package which starts at $189 per night, kids will be treated by Santa delivering presents, cookies and milk to guest rooms. Take time to bring your family to Branson Missouri and experience the one of a kind Christmas. Enjoy the millions of holiday lights, carolers singing your favorite Christmas songs, festivals, shopping, dining and hospitality. Branson is truly a magical place for the whole family. After the Manny Pacquiao win, all of a sudden I got associated with the Pacman here at my job. I am the only pinoy here, oh correction dalawa pala kami pero yung isa dito parang ayaw umamin na pinoy sya porke ‘ala ng accent mag-english pero please sa kulay pala di maitago…nway, for those who have watched the fight or heard about it, when they see me, they are like..”that pacquiao from Philippines was unbelievable and super fast!” There was even one Puerto Rican yesterday and he was super bilib kay many. Even my husband told me that people will yell at him “pacquiao!! !” (pero slang) as they see him along the corridor. It’s the Pacman fever. Congrats again Manny. I think I have found the right vacuum I need. I have been shopping for a hand vacuum, but until now I have not made up my mind which model I should buy. I need one that is portable and can be carried inside the van. I also want one that is powerful enough to pick up hair and cereals and has a skinny hose to reach in between chairs. I am so thankful that this dirt Dirt Devil Holiday Gift Guide is now available. I am browsing 19 different kinds of dirt devil hand vacuums right now. Each type of vacuum has an image gallery that can be enlarged for better viewing with all the features and description written. You can even download the manual online. The best feature that really helped me is to be able to compare at least 4 products. This guide is really helpful to shoppers like me. Dirt Devil is also offering free shipping to a lot of its products and with this holiday buying guide, we can avail the almost 300 ways to save with online shopping. Dirt Devil is giving us a new way to shop this Christmas with their holiday deals at dirtdevil.com including gifts for her, gifts for him, family favorites and even hard to find and one of a kind gifts. You don’t have to step out of your house to shop this holiday season. Save gas and do your shopping online in over 300 websites at dirtdevil.com. I was making a cashout at SS and I got this message: "sorry you must have a minimum of $50 to withdraw." It used to be a minimum of $20 only, right? Did they increase the minimum recently? This would take sometime to cashout now because I hardly get bigger opps. Even the small ones are hard to get too. Di na kagaya noon. My friend called me from California asking if I can recommend a very reliable guy that can fix the water damage in her house. She knows that I had experiend this in our house before in Orange County and being a first time homeowner she has no clue on how to fix house problems like this. For all water damage, leaks, flooding and plumbing problems before, we only called able restoration, the most trusted Water Damage San Diego, Riverside and Orange county areas. They have a 24/7 hotline (1800-696-6676) and 24 hour emergency service. They know what your concern is as soon as you make the call so they give you the attention and professional service you deserve the soonest possible time. So if you live by the San Diego area, better keep their phone number handy. You will never know when you need them. We have a sony bravia at home and for the past week we noticed some horizontal lines across the screen. We pay no mind as it disappears after few minutes of watching TV. It happens when you first turn on the tv. Now for the past days, more thin fine lines are coming out and sometimes you cannot see the picture anymore. It is like a blank blue screen with plaid colored design on it. You can still hear the sound though. We cannot watch anything so we just turned it off. Few minutes later, my husband turned it back on and the lines were gone. Fine again but not permanently. We still get the lines every now and then. My husband was saying maybe it’s time to change the bulb…..like what bulb???? Is this a plasma defect or a symptom of trash the tv/spend a lot of money for repair thing?!! This TV is more than a year old. If I remember we bought it from Costco sometime August or September last year. Anybody had this problem with their tv? I am a person that loves to listen to music while working. I always listen to different radio stations online to listen to different music but I do not think I will be doing this the whole time I am at the office anymore. All the employees have been asked to minimize streaming music because it slows down the server. This is actually not a big problem with me because I can always use my ipod at work. I was able to download a lot of songs to my ipod this weekend. I have been using the new search engine queen torrent every time I download music online. This powerful search engine is very simple but give you thousands of results by just a simple search. Your search result gives you the different categories available and the size of the file. Other than music, I was able to download many games, free movies with no interruption or incomplete file. Try this new search engine at queentorrent.com. This is the best shoes for me during winter time. My feet never gets cold even if it is freezing. I love Ugg boots. This is my third pair. My first one is beyond beauty because it was buried in the snow but still usable and the second one is still in good condition. The first two are camel colors and I bought this one at 50% off last summer. 50% off ba naman so no second thoughts...buy kaagad! I work in a company that deals with clients around the world. All our correspondence is made in English but there are still instances that we need the services of a professional translator. I am happy to say that having different languages has never been a problem to our business relationship. All our business card translation is done through translia.com, the world’s largest professional translator network. We get all our job translation from/to any major language at the fastest time. Pricing is very reasonable and sometimes we even get it for free. Most importantly, their jobs are 100% client satisfaction guarantee. If you are not fully satisfied with their job, you do not pay for it. It was a cold day and perfect for an arroz caldo. There is no other place to have it but at Red Ribbon. I am so happy that there is a branch 10 minutes from our house. 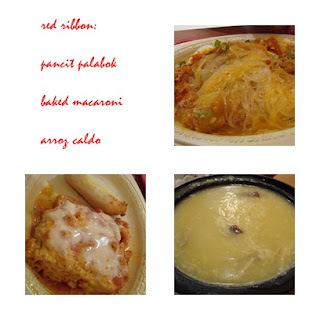 My husband had the sotanghon and the baked macaroni for the daughter. Other than these, we also had ensaymada, mamon, chicken empanada and siopao to go. If you are curious how much a Red Ribbon meal cost here in our are, for a combo which is any of the above, cake and soda it is $7.00 plus; kung sotanghon lang it's $4.00 and change. We already got the Business Christmas Cards we ordered for our customers. 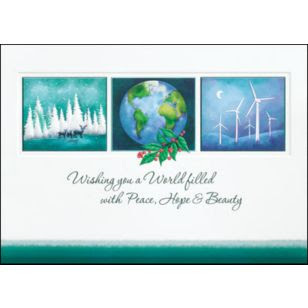 The design is very different from the previous Christmas cards we had the past years. My boss wants something that is about nature this year so we picked this design for our company. We will start mailing out these cards first week of December for our customers who are outside the U.S.
For all your business card needs, Brookhollow has a wide selection of design for different occasions. All cards can be personalized and they come with matching envelopes. They also have calendars and box chocolates for giveaways to friends with your business name printed on it. Go to their website and check out the various designs they have. This is the best time to place your orders with brookhollowcards.com and avail of the holiday discounts. I could not believe that my $10 can buy me a pair of prescription eyeglasses. At zennioptical.com I can buy $8 prescription zenni glasses that are of good quality, fashionable and trendy. Probably, I can treat myself with several pairs of holiday fun eyeglasses from zenni. This is exciting because I will be buying different colors to match my outfits. I don’t want to miss any of zenni’s good deals so I’d better check their new arrivals too. After trick or treating Saturday night, we were all tired and lazy to prepare dinner. And also, the Yankee game is less than an hour away so we have to eat something quick. 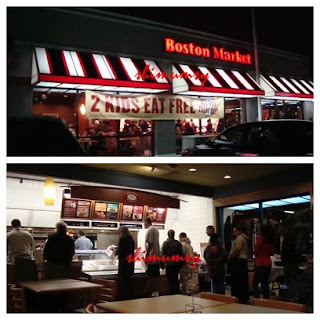 The $1 meal from Boston Market saved our empty stomach and laziness. We thought we can just eat and run but do you see the line? Hey, it's a $1 meal! The line was not bad at all. We planned at first to take the food to go but we got the news that the Yankee game was rain delayed so we stayed at the restaurant and take time to eat. Many thanks BM for the dinner!